They say men are hunters and women gatherers- not just in the context of scouting for food and shelter in ancient times, but so also in today’s shopping scenes. The increasing purchasing power of male shoppers has spawned a new class of consumers who don’t shop for utilitarian but stylistic functions. They can’t be called the ‘selfish shoppers’ anymore because as much as they pick, they browse. Today men prefer to wear their personality, be it to work or for personal occasions. Apparels are considered to be identity badges, communication by fashion choice. That time is passé when men preferred chairs over trial rooms in stores and let their female counterparts choose outfits for them. Shopping is no more considered the ‘girl thing’ and men are taking an upper hand in choosing the best cuts and fits that resounds well with their identities. They believe, ‘looking good isn’t self-importance but self-respect.’ The male apparel consumer is shifting from need-based clothing to outfits which best express themselves. Most importantly they demand for experience, variety and fun while shopping. It is clear, there is definitely a new breed of unconventional male shoppers taking centre stage and disrupting the way retail was perceived. This profound shift in men’s fashion is largely due to the changing experiences in their lives. Subsequent to the realization of more relaxed work environments, men don’t have many restrictions in choosing their work wear. If earlier their minimalist attitude inhibited them to shop separately for work and leisure, the fading borders are now giving them the option to wear their choices. The new age men prefer exclusivity, comfort with style, practical and functional with aesthetics. Life is on the move. In this changing dynamics of work and social life, it is imperative to have comfort and stretch while making a statement in the super consuming lifestyle. In par with these changing customer needs, menswear brands need to up their game and come up with curated fashion precisely tailored to their needs- comfort fashion which stretches with him throughout the stretch of the day. It has been observed men prefer to shop from brick-and-mortar retail stores over online platforms. Men give more weightage to the look and feel of a material before making a purchase, quite contrary to women. They don’t embrace technology disruptors as much as their female counterparts do and make choices as per perceived brand equity and in-store experiences. Creating a distinguishing brand identity is therefore an important strategy menswear brands should focus on. Considering men are loyal shoppers, providing them with a good product and a great experience will ensure they will stick to the brand longer. In retail, men stand for higher transaction value and ideal cross-selling targets. Interestingly still, men tend to get convinced easier than women. Women make purchase decisions basis not just their own perceptions but also as per what her friends thinks is good. Therefore, it becomes important for women’s fashion brands to influence a wider target audience. However, marketing to men is simple and straightforward. 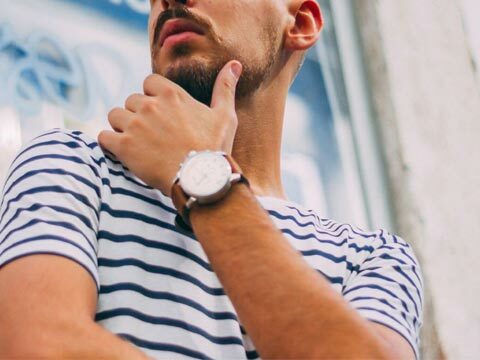 Unfortunately the male apparel segment is largely undifferentiated and brands need to drive greater awareness and visibility to stay on top of their mind. Care should be taken in visual merchandising and in-store displays so that what the brand stands for, beyond discount deals, is clearly registered in the customer’s minds. In-store impulse is considered to be the most impactful trigger among male shoppers. While advertising could help in pulling crowds to the stores, men make their actual purchase decisions based on their real in-store experience. Therefore it is important brands create an engaging experience for the customers, engineering all the marketing efforts to maximize their appeal at the store. A customer buys into the vision that the owner creates for him. Designing a menswear showroom should no more be considered an afterthought of the retail fashion industry. A shopper today walks into the store after doing enough research on the brand- its provenance, customer reviews, quality and a lot of other qualitative information. A personalized approach (up-close, hands on) while talking to the customers in the shop hence once again becomes a necessity, but this was overlooked in retail over the last decade. The employers of a retail shop should be equipped with enough emotional intelligence to create a ‘human experience’ for the customer. Men take time to form habits, but once they do, they stick to it. Establishing a ‘connect’ is therefore key and they expect it every time they are in a store. The male shopper can’t be a taken for granted customer anymore. As the ‘mansumer’ is evolving to be more results-driven yet comfort and style conscious, it is important to not bombard him with too many but more personalized choices. Fashion brands should emerge to be a one-stop solution for his changing needs and thus emerge to be his complete style partner.